Outermost part of our planet's atmosphere extends well beyond the lunar orbit – almost twice the distance to the Moon. A recent discovery based on observations at the ESA / NASA Solar and Heliospheric Observatory, SOHO, shows that the gaseous Layer that wraps around Earth reaches up to 630 000 km away, or 50 times the diameter of our planet. "The Moon flies through Earth's atmosphere," says Igor Baliukin of Russia's Space Research Institute, lead author of the paper presenting the results. "We were not aware of it until we dusted off observations made over two decades ago by the SOHO spacecraft." Where our atmosphere merges into outer space, there is a cloud of hydrogen atoms called the geocorona. One of the spacecraft instruments, SWAN, used for sensitive sensors to trace the hydrogen signature and precisely what the very outskirts of the geocorona are. These observations could be done only at certain times of the year, when the Earth and its geocorona came into view for SWAN. For planets with hydrogen in their exospheres, water vapor is often seen as closer to their surface. This is the case for Earth, Mars and Venus. "This is interesting when looking for planets with potential reservoirs of water beyond our Solar System," says Jean-Loup Bertaux, co-author and former principal investigator of SWAN. 6 astronauts in 1972, captured an evocative image of the geocorona surrounding Earth and glowing brightly in ultraviolet light. "At that time, the astronauts on the lunar surface did not know that they were actually embedded in the outskirts of the geocorona, "says Jean-Loup. The Sun interacts with hydrogen atoms through a particular wavelength of ultraviolet light called Lyman-alpha, which the atoms can both absorb and emit. 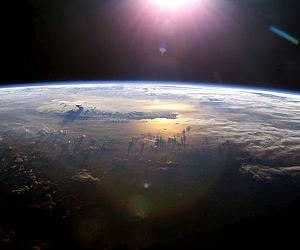 Since this type of light is absorbed by Earth's atmosphere, it can only be observed from space. The new study revealed that sunlight compresses hydrogen atoms in the geocorona on Earth's dayside, and also produces a region of enhanced density on the night side. The denser dayside region of hydrogen is still rather sparse, with just 70 atoms per cubic centimeter at 60,000 kilometers above Earth's surface, and about 0.2 at the Moon's distance. "On Earth we would call it vacuum, so this extra source of hydrogen is not significant enough to facilitate space exploration, "says Igor. The news is that these are not threatened by space travelers on future crew missions orbiting the Moon.
" There is also ultraviolet radiation associated with the geocorona, as the hydrogen atoms scatter sunlight in all directions, but the impact on astronauts in lunar orbit would be compared to the main source of radiation – the Sun, "says Jean-Loup Bertaux. On the down side, the Earth's geocorona could interfere with future astronomical observations performed in the vicinity of the Moon. "Space telescopes observing the sky in ultraviolet wavelengths to study the chemical composition of st. ars and galaxies would need to take this into account, "adds Jean-Loup. This location is a good vantage point to observe the geocorona from outside. SOHO's SWAN instrument imaged Earth and its extended atmosphere on three occasions between 1996 and 1998. Jean-Loup and Igor's research team in Russia decided to retrieve this data from the archives for further analysis. These unique views of the whole geocorona as seen from SOHO are now new light on Earth's atmosphere. "Data archived many years ago can often be exploited for new science," says Bernhard Fleck, ESA SOHO project scientist. "This discovery highlights the value of data collected over 20 years ago and the exceptional performance of SOHO." 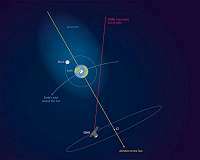 "SWAN / SOHO Lyman-alpha mapping: the Hydrogen Geocorona extends well beyond the Moon" by I. Baliukin et al is accepted in Journal of Research Report: Geophysical Research: Space Physics. We need your help. The SpaceDaily news network continues to grow but has never been harder to maintain. With the rise of Ad Blockers, and Facebook – our traditional revenue sources through quality network advertising continues to decline. And unlike so many news sites, we don't have a paywall – with those annuities usernames and passwords.